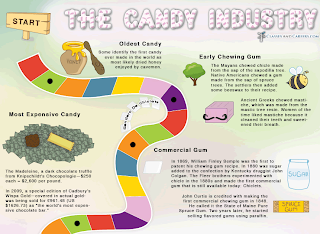 To get younger students used to looking at infographics, why not use what they know: sweets. They will already have prior knowledge about the topic, since most kids have had a mouth full at some point. Let's face it, what better way to get them engaged in the information? Start with The Art and Science of S'Mores. 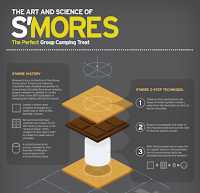 It's not only "the perfect group camping treat," but also the perfect infographic for a group discussion. It has everything from a graph about the marshmallow roasting scale to the "eternal question" of how to roast them -- glowing embers or flames? Kids will savor the notion of thinking about all the different pieces of information. 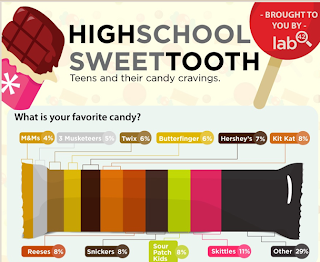 Two other infographics that focus on sweets that would be good to use with younger students are The Candy Industry and High School Sweet Tooth. Both provide a wealth of visuals, data and information. 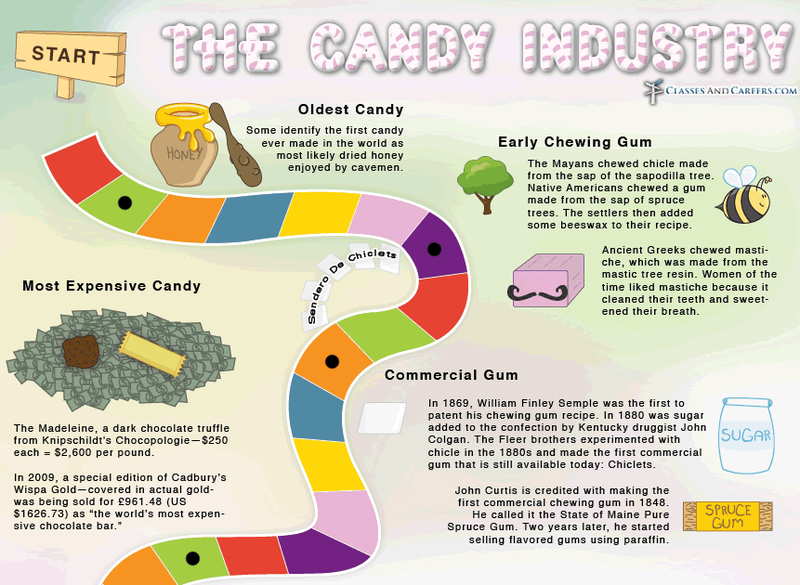 The Candy Industry is designed to look like a game board that starts with a brief history. 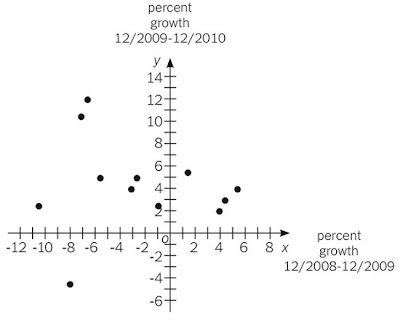 Moving down the squares, you cross the paths of charts and consumption for a little math. Further along is the section on geography, complete with a map of popular candies by sale in foreign countries. Financial information is next, with leading manufacturers and the most popular candy by sales, M&Ms. Keep moving along the board for more math with weights and measures, including calories, and finish with some unusual candy ingredients. What's nice, too, is that this "sweet" infographic provides the sources used for creating it. Kids will also love looking at this one, because it is so colorful and full of fun facts they can sink their teeth into. It also is interdisciplinary in nature, covering a multitude of things for different subjects. The other, High School Sweet Tooth, claims to have created the graphic through a survey fielded to 500 Americans, ages 13-17, with the use of social networks. Not exactly scientific, but nevertheless interesting for the purposes of introducing younger students to the world of infographics. Like its counterpart mentioned above, this colorful and playful infographic illustrates the results of a survey that set out to gauge the candy cravings of teens. It provides chart data for how often they eat candy and where they usually buy it. It even has a little media literacy built into the survey that asked about recognizable slogans and how well candy could be identified without the packaging. All three of these infographics make good instructional resources for working with students. The subject matter is familiar and provides an identifiable place to begin learning to analyze information, data and images that make up these types of visualizations. When you finish with these, try looking at "S'More." According to Wikipedia, digital curation is the selection, preservation, maintenance, collection and archiving of digital assets. It is the process of developing a plan to create repositories of digital information for current and future reference. The encyclopedia maintains: “Enterprises are starting to utilize digital curation to improve the quality of information and data within their operational and strategic processes.” (Wikipedia) A digital curator, like that of a museum curator, preserves and makes available the digital material in a collection or as part of a company archive. The only difference is it is “e-based,” or in other words, electronic. If we take this a step further, we don’t have to be part of an organization to be digital curators of our own information. We can design our own repositories that go far beyond the basic bookmarking, which is in a sense a form of digital curation. 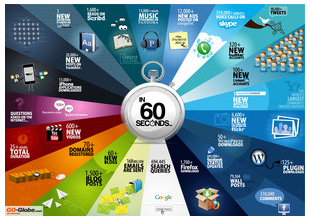 We have only to look at the infographic, What Happens in 60 Seconds on the Internet, in this post to see the need for selectivity. It is also clear about the need to educate students on how to curate digital information for their own future references. As we mentioned in an earlier post on digital consumption, weeding out digital junk is key to curating information for quality and reliability. Essentially, it is designing the information that we want to keep and eliminating the digital glut we don’t need or want. Social networking websites such as Facebook, LinkedIn, and Twitter do this now by allowing users to select, or curate, who they want to be in touch with on the web. For example, Twitter lets you curate your own list to follow, or you can follow lists curated by others. Other websites also help with designing information selection. One is Scoop.It!. It uses a headline on its homepage that reads, "Be the Curator of Your Favorite Topic." Scoop.it! lets you create a topic on any subject. Then it crawls the web and regularly feeds your topic. You can select, scoop, edit and share the content of your topic with others. The user curates the design of information. Pinterest is another website for selecting what you want to follow. Its earlier logo included a line: “go on…curate the Internet.” Pinterest promotes itself as a virtual pinboard to collect the things you love. The advantage of many of these websites is in the power it gives us to curate the types of information we want and to weed out the others. In a world of information overload that multiplies faster in 60 seconds than rabbits in spring, it is important to teach students about designing information for digital consumption by making them better digital curators. The more instruction we give them about how to manage the digital world, the better they will be at making quality choices. "Talk to Me: Design and Communication Between People and Objects" is a new exhibition at the Museum of Modern Art in New York. Talk about digital consumerism, this is a feast for the visitor. It invites viewers to participate in every way, from apps to social media. The exhibition is designed to communicate with it, tweet about it, or capture QR codes on your smart phone for any object on display, thereby reinforcing how the interaction of people and objects pervades our everyday world. It emphasizes the differences in communication by the very nature of how it delivers the information. For example, some things speak, while others communicate in text or graphic interfaces that interact with us in either direct ways or subtly. Some highlights from the exhibition include The Wilderness Downtown. This interactive website works best using Google Chrome. The design of this website allows a user to type in a street address using a drop down menu and click play. The site combines music with a hooded, running figure in a movie type setting that combines with Google maps to pan aerial and street views of that location. At the end, it lets you draw or type a postcard of “advice to the younger you that lived there then.” Fascinating and fun! Another piece on exhibit is an interactive station called They Rule. 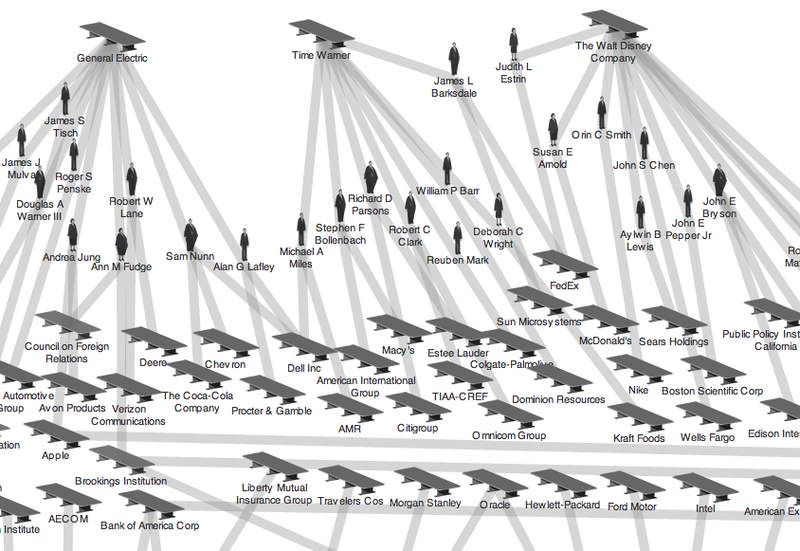 This is another website that allows users to create visualizations using interlocking directories of “some of the relationships of the U.S. ruling class” from the boards of the most powerful companies to individuals in corporations and government. Users can save a map of connections with annotations and links to share with others, such as the sample you see here. Hide & Seek also has a spot in the exhibition. It is a game design studio dedicated to inventing new kinds of play. They believe "that play, as a theme, a way of being, and design tool, is integral to understanding how culture will develop in the 21st century." Check out its website for ideas, including the Board Game Remix Kit. Today, design must be dynamic, interactive, animate, and communicate in ways not available a decade ago. It is key as we move through the next century and should be a part of every teacher’s tool kit. We need to integrate it into all types of curricula, and by doing so, we will simultaneously broaden our integration of technology in a seamless way. This exhibit is a clear example of how design is not just considered an aesthetic, but instead it is a process of taking a concept from its formative state to its final outcome. Engaging students to envision an idea and communicate that through design will enable them to develop and create new ways of seeing. Not only can thinking like a designer transform the way children learn, but also it will cultivate their creativity. And, without a doubt, creativity is the underpinning of inspiration, imagination, and innovation. Visually we are there. You name it; we have it from streaming videos on YouTube to television shows on Hulu. And of course, let’s not forget the treasure trove of pictures from Google, Creative Commons, and more. In other words, we have all the visuals we need to design, create, and use in teaching. Students can consume vast amounts of digital content from countless sources. If there were ever a case for teaching visually, it’s now. But even more important is to teach students to think about and interpret the quantity of digital material they come across daily. 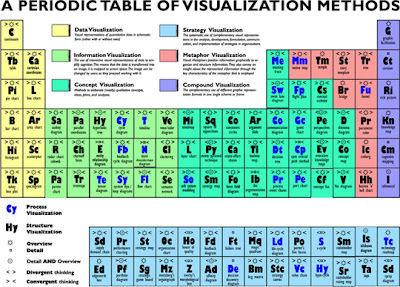 To grasp the types of visual interpretations, one has only to look at the Periodic Table of Visualizations with its 100 different methods for looking at information. Like the chemical elements, this periodic table classifies the types of visualizations into eight groups, including data, strategy, metaphor, compound, concept, information, process, and structure visualizations. The table is color-coded according to these groups, and each box in the table includes a pop-up example of that particular method. The fact that there are 100 different types included in this table does not take into account the countless others that were excluded or the enormous number of other images they see. In addition, understanding visualizations is not just relegated to the sciences and geography anymore, but rather it has become a routine way to present information. We’ve all witnessed the daily craze in using infographics to make information “simple” to digest and the countless data maps for just about anything. Information, images, infographics are all a dime a dozen. “So What?” As the deluge of digital media grows, so does the exposure to it. With that, the amount of digital consumption goes up disproportionately to the amount we can take in and process. If it were our diet, we would be obese. We need to adapt methods to teach students how to think about the things they see not as fleeting views. They need to know how to study digital content for meaning as a matter of necessity in order to weed out digital junk. Educating our digital consumers in how to move past the sound bites, the flashy images, and the interactive movements on the computer screen takes on a larger significance in a technological world full of gadgets and gizmos. Just like food, we have plenty of treats to eat that don’t necessarily have nutritional value. The same goes for the treats we are tempted by in the digital world. They, too, add to our experience, but they do not necessarily broaden our knowledge base. Learning to question the value of what to consume will develop skills for selectivity. Digital junk is produced daily and without instruction in an educational environment can be consumed without regard to legitimacy. As educators, we need to teach the nuances of knowing what’s on one's plate and whether it is good for consumption. Teaching students how to deconstruct the marketing, design, and interconnections of information will enable our students make healthier choices about what they choose to consume. Sometimes it's the simple thing that brings an idea to life. Check out this video presentation Tommy McCall gave at the TEDx East conference in May 2011 on Literacy, Numeracy and Graphicacy. He founded and operates the data visualization agency in New York City called Infographics.com. McCall sees himself as a producer, designer and data editor. In all these roles, he believes he “must understand the information, question its veracity, and convey its core message.” This is exactly what we want our students to do and is at the core of information literacy. For McCall, “graphicacy, the ability to communicate visually, will be an important skill set for future generations, just as literacy and numeracy are today.” It is clear, concise and worth the watch. Former Speaker of the House Newt Gingrich has so far faced a rocky rollout in the formative months of his presidential campaign. After staff defections and bourgeois revelations, Gingrich has retooled his team to concentrate on a lean, local approach to the Republican nomination. 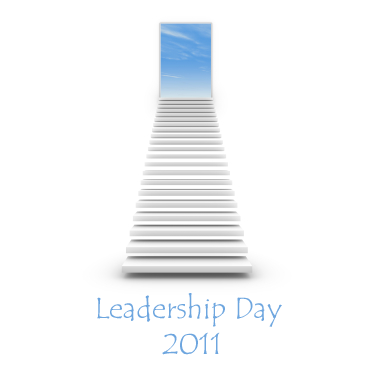 His logo, however, suggests that Gingrich has been leading the nation for years. His banner implies that Gingrich is so familiar to the voter that the visual focus can rest on the seminal year of 2012. In height and font, the date is emphasized equally as his name, underpinned by a traditional star and red swoop. Gingrich uses only his first name – seemingly resonant, unpretentious, and well-acquainted. His unique moniker over the decades has indeed become part of the daily conversation, with a back-of-the-hand comfort like “Hillary” and “Rudy” in 2008. Gingrich is the only candidate so far in 2012 featuring solely his or her first name. Gingrich’s overall effect broadcasts a regal, high-on-the-hill, red-wagon sensibility. The design is suitably classic and nationalistic. Gingrich’s website also is tucked subtly in the corner, prominent enough yet also quirky enough to get us thinking: Why dot.org? Why just “Newt”? It turns out other similar websites were already claimed, and some urls link to for-profit ventures selling Gingrich’s DVDs and books. The casual browser, therefore, should be careful when searching for his site. 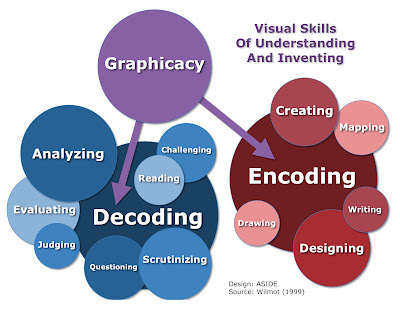 For Spielman, graphicacy should be considered a core competency just as literacy and numeracy, and children need to formally learn these skills in the primary grades to give them competitive advantages in a world full of graphical information. Building a foundation in these skills into the curriculum will help children develop a common language for graphic communication, an understanding of design, and a way to more accurately represent data. The daily use of graphical devices and images to create visualizations will not be as readable without having learned the skills to do so. 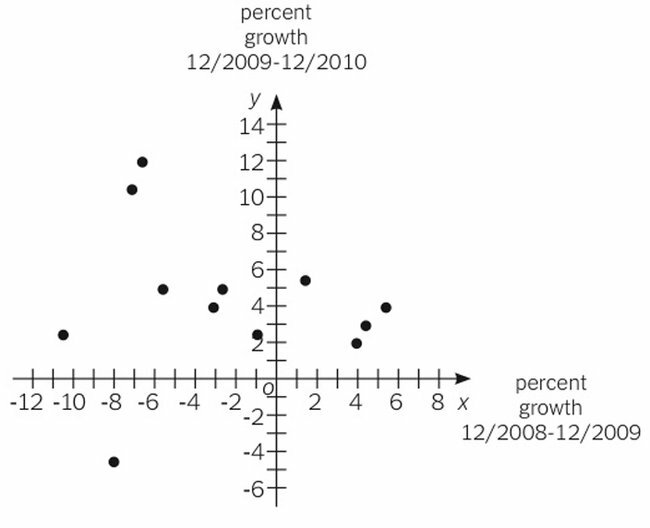 As it was mentioned in an earlier post on graphicacy, authors F. Aldrich and L. Sheppard, like Spielman, maintain that if there are gaps in understanding the various symbols for interpretation or if they are not explicitly taught and reinforced, then gaps in knowledge, misinterpretation of data, and confusion of meaning increase. It should also not be assumed that children have the skills to construct meaning of views, forms, and commentary without being taught these skills explicitly. Things we take for granted as adults, such as cross-sections, changes in scale, or distant views, are not necessarily viewed the same way by children. At a young age, their views are much more literal, leading to misunderstandings of what they see. 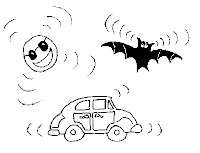 Commentary objects, too, such as lines and arrows, can also be misunderstood by young children to be part of a graphic, especially if they are not given prior knowledge explaining why they are included. For example, drawings showing emotion, such as trembling or excitement, often include commentary lines to help express those emotions. You cannot actually see these objects radiating from a figure expressing emotion, and children learn that early on reading in picture books. Likewise, when viewing graphical information, lines can indicate movement, sound, or light, and arrows can label, indicate direction, or show sequencing. Aldrich and Sheppard point out that without instruction to learn how commentary objects are used, young children take them to be a literal part of the graphic and do not see them as separate. We have only to look at the various types of graphic information in children’s textbooks to see the variations and inconsistencies to realize how these could cause confusion if not given graphicacy instruction. As teachers, there are a host of resources for designing graphical information, such as ManyEyes or Chartle.Net to name a few. Our resource page has many helpful links. The most important thing, however, is to include as many possible types and variations to teach children. 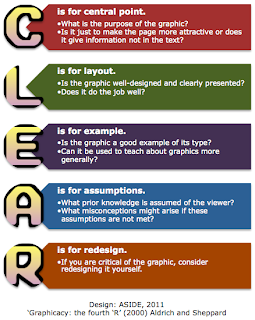 For Aldrich and Sheppard, it was CLEAR, their mnemonic form for remembering the criteria for selecting graphical information as a teaching aid. Looking at more examples and inviting children to think about them harder would invariably pay off in developing their graphicacy skills. 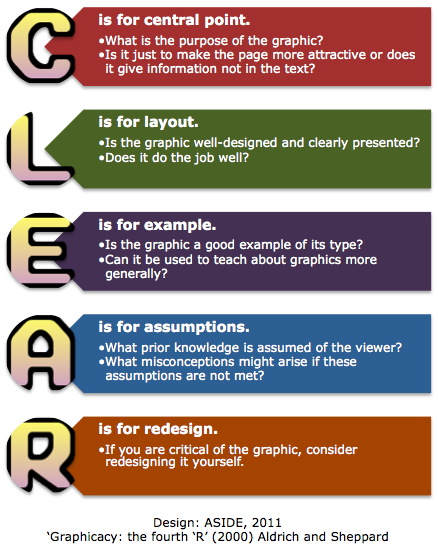 Check out our other posts about graphicacy education. In a previous post, we addressed D-LIT (design, literacy, information and technology) in creating stories using Storybird. Another Web 2.0 resource for digital storytelling is VoiceThread. This application can easily be used with young children to publish multimedia stories that they create by combining voice, illustration and text. VoiceThread, like Storybird, brings design, literacy, information and technology (D-LIT) all together, and because it is web-based, they have easy access to hear and read their published books again. 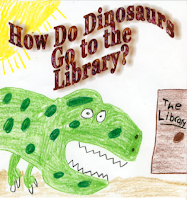 Our first-grade classes put together a work of fiction as a collaborative book. 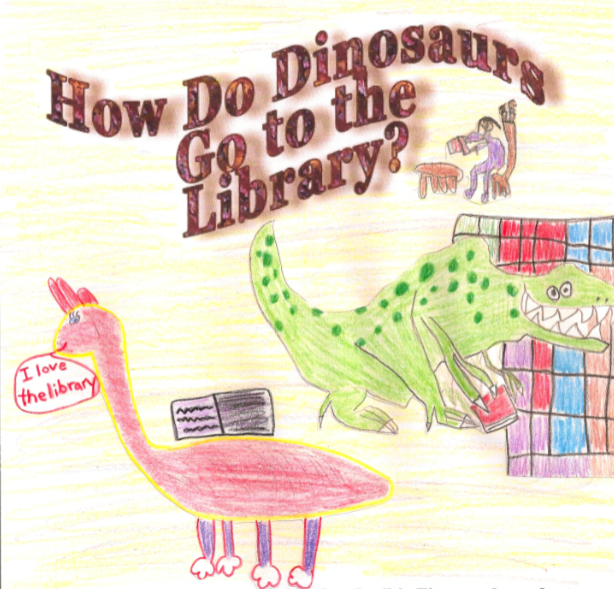 The example you see here, called How Do Dinosaurs Go To the Library, was part of an author study of the How Do Dinosaurs… series by Jane Yolen and Mark Teague. 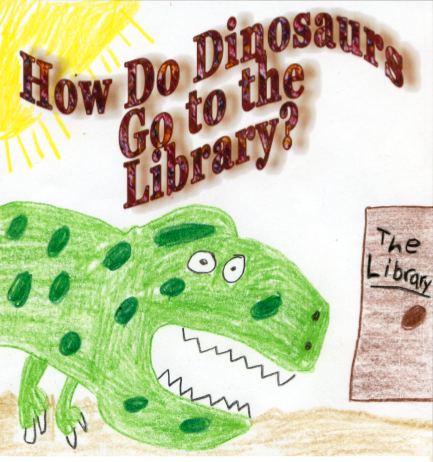 The students analyzed how the author divided what happens in each of the books between Dinosaur do's and dont's and observed how the illustrator incorporated the dinosaurs into the world of humans. They listened to the patterns and rhymes in the story to try to mimic what the author did in theirs. Each student added a sentence in a brainstorming activity to take them from the beginning to the end. After this, the students designed illustrations to go with their words in the book. The final piece was to have them record the words to their pages using VoiceThread. The excitement in publishing a book, hearing their own voices read aloud, and being able to play it over and over allowed them to share their experience with family and friends. They still go back to the website to listen, and the stories have become teaching tools about using the library for others. 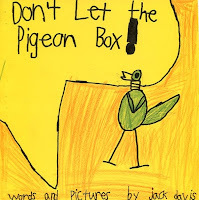 The other project that we did with our second graders was an author study of the Pigeon book series by Mo Willems. 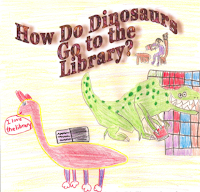 For this project, the students worked out a storyboard based on the conventions the author used in this popular and humorous series. 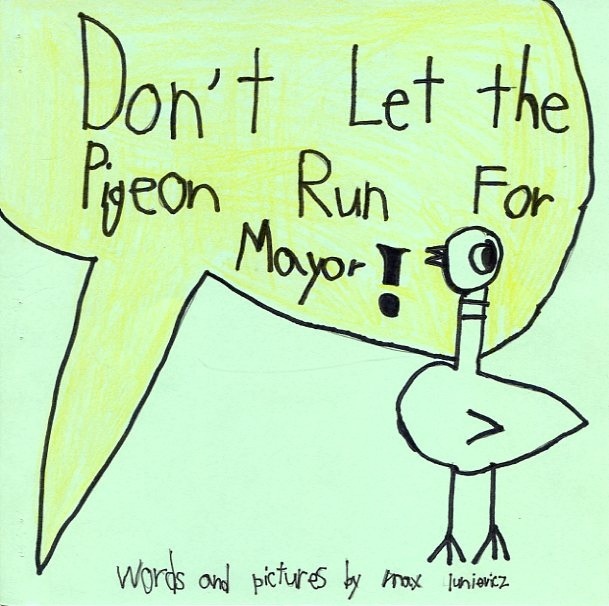 They especially liked designing the page where the pigeon "loses it" because it does not get what it wants. 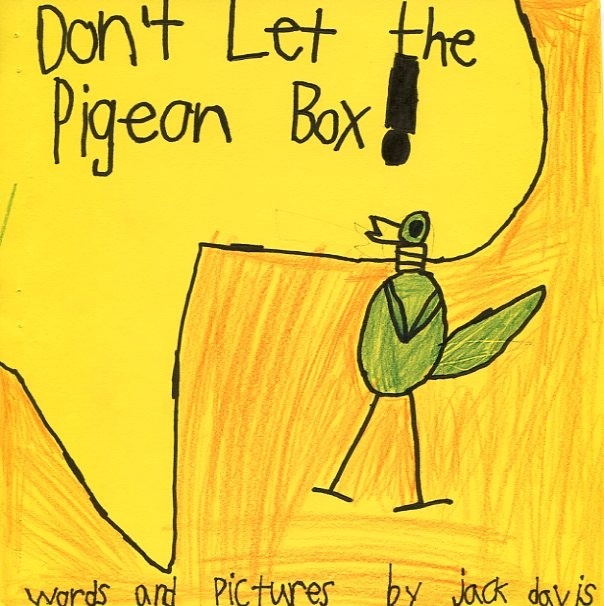 The students had full choice over the subject matter for their original stories and happily engaged themselves in learning how to draw pigeons using the author’s website called “Pigeon Presents.” We often put up sample drawings on the interactive white board to convey the pigeon's emotions and body language that they could browse on their own for ideas. The original hardbound copies were put on display in the library, and a sampling of their works was recorded using VoiceThread. 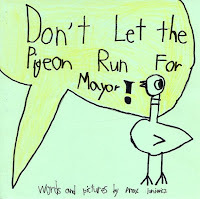 They were truly empowered by the experience and quite honestly kept drawing pigeons the whole year. For a look at these original creations, please visit the Digital Storytelling page. Congressman Ron Paul has been the loyal Libertarian warrior for many years, serving 12 terms in his Texas district and now waging his third rabblerousing campaign for the presidency. In fact, he announced on July 12 that he would not be seeking reelection to the House in order to focus on his presidential goals. Perhaps this explains why his 2012 brand conveys such a sense of urgency. In his prominently placed slogan, he emphasizes the all-caps “now,” suggesting that the nation must immediately return to some past, lost glory. Paul’s team brings a modernity of shadow graphics to his emblem, evoking the classicism of the eagle and the United States seal. Indeed, his rendering is close to the official presidential seal, which is likely intentional and evokes feelings of strength and natural successorship. The overall effect leans strongly on American values. Paul’s name is emblazoned in equally strident capital letters. A singular tuft of red appears on the “A,” dynamic and uplifting, like stars shooting over a mountain. It is unclear, however, why such a klaxon bestrides the “A,” and the emphasis is unusual in breaking the symmetry of the other formal, seriffed letters. Paul’s banner also is noteworthy in not using the word “president” anywhere. This deliberate omission suggests a familiarity with his candidacy, that he has run before, that he is a known quantity. His logo reinforces that his views are principled and directly linked to his name and persona, not to the job he seeks. In all, Paul’s design for the upcoming primaries puts him much more in the “establishment” camp than in his prior grassroots efforts. This legitimacy and this effective branding could make him a force in the Republican discourse. By the way, here is a fun, gimmicky site to replace the text of the presidential seal with your own name or your students’ slogans. Two weeks ago, the education section in The New York Times highlighted the upcoming changes to the GMAT business school admissions test. Starting in June, the exam will replace one of its essay responses with a new section focused on multi-source reasoning and graphic interpretation. Apparently, business school professors were asked what skills are not being addressed by the GMAT that are the most pressing in the current business world. The answer was data interpretation and visual analysis. If graduate-level tests are racing to catch up to the urgency of graphicacy, then why we can't we give our future entrepreneurs a head start? We can begin financial literacy and visual literacy in the earliest grades. We can integrate financial and graphic lessons into our daily classrooms with the simplest of charts, graphs, and tables. And maybe one day our students will use these tools in business school and beyond to nurture ingenuity and innovation. What makes us do the things we do as teachers? Do we call it opportunity, responsibility, or motivation? Countless books, articles, and news reports look at the education system and question where the problem is with motivating students. Well, what about the teacher? We could argue that if we take away our passion for teaching, we in effect take motivation away from our students, too. Forced deadlines for units of study, scripted programs, and off-the-shelf “boxed” curricula leave little room for creativity. Teachers, like students, need to feel empowered to make choices to engage their learners in a more meaningful way. Regardless of medium or era, education has always been the act of offering information for acquisition. “Learning” is the individual process, where one internalizes new concepts or skills. “Education,” though, is the active delivery – the technique of shaping and structuring ideas by an instructor so a student assumes them readily and permanently. The two most obvious changes in educational delivery over the past 15 years have been the visual representation and immediacy of information as a result of technology. Communication has advanced along an accelerating continuum from the town crier to the printing press to the telephone, radio, television, and Internet. The change in fact-finding, however, is different from simple communication. Essentially, we are motivated by the idea that teachers, as well as students, can “map” the way to change and technology has made this possible. When teachers and students both share in designing the learning, they are driven to take responsibility, seek opportunity, and desire more. Innovative design crosses over all aspects of education. Integrating the design of information into the daily conversation by integrating technology into the 21st-century classroom is essential. It is a necessary part of the teacher's toolkit. The underpinning of good educational design is based on looking at the information available and communicating meaning for a world of learners. Technology has retooled how we teach and how students learn and used effectively the payoff is substantial. We try to remind ourselves that even though our students are bombarded with visual stimuli, they don’t always grasp how to parse the incoming images. We’ve cautioned before against assuming that students can intuitively “read” pictures and graphics. If graphicacy refers to the roster of skills necessary to comprehend optical inputs, then we can communicate these skills by teaching the decoding and encoding of visual data. For us, decoding means judging, evaluating, challenging, or knowing the message underlying a cartoon, chart, or corporate brand. Encoding, on the other hand, is often the overlooked sibling in education. Encoding in many ways is the truer test of internalization, because it involves the ability to produce unique representations that reveal the layered skills of graphicacy. For us, encoding means creating, drawing, writing, or designing original and meaningful graphics. Balchin and Coleman (1965) first introduced the term graphicacy to refer mostly to geography education. They meant to emphasize a spatial understanding that could not be conveyed solely by words or numbers. In his noteworthy paper, “Graphicacy As A Form Of Communication,” P.D. Wilmot (1999) of South Africa’s Rhodes University builds on Balchin’s, Coleman’s, and other scholars’ work to argue that an inclusive curriculum in graphicacy must be added to national standards. Former Minnesota Governor Tim Pawlenty has been preparing for his presidential run for several years. We assume, therefore, that his message has been carefully sculpted in the months of planning. His name on his official campaign banner features subtleties in fill that generate eye-interest within each Britannia blue letter. The gradation, however, carries no clear significance. The haziness opts for design appeal in lieu of overt messaging, which could be a curious mistake given the amount of time likely dedicated to assembling Pawlenty’s insignia. The Republican candidates have been divided over whether in their logos to include their full names or just their last names. Pawlenty opts for the latter, which is atypical among lesser-known politicians. He accentuates a capital “P” and “Y,” unusually highlighting the end letter to his name. The scheme creates a visual symmetry, but it simultaneously lacks any parallel significance. The two letters, for example, are not identical, and they do not hint at any larger importance through the bracketing effect of the larger letters. A lot of design space is dedicated to the intentionally incomplete, shabby-chic rendering of the flag and stars beneath Pawlenty’s last name. The fluidity suggests movement toward a goal, toward an as-yet-incomplete America. The Crayola rubbing quality and irregularly sized stars imply a childlike quality, resonant to soccer moms and suggestive of a down-home, unaffected nature. The casual depiction, however, seems immature for a potential leader of the free world. The drawing reminds us of an inverted New England Patriots’ football logo or Revolution soccer logo. 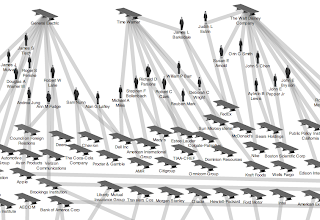 This lineage could be a clever mental link to winning sports franchises. It could also confuse the viewer by redirecting one’s visual-memory toward other well-established brands in the media zeitgeist. In all, there is little in Pawlenty’s logo that screams “strength.” Instead, it gestures toward unthreatening evocations of familiarity and straightforwardness.